Ardor Media Factory > Blog > Blog > Is Marketing a One Time Payment? An analysis of how much you should pay attention to your marketing & SEO. Marketing and SEO should be at the top of most people’s agendas when it comes to promoting an online business, but the majority of businesses believe then that once their part is done then there won’t need to be any more edits made again… until it looks outdated anyway. We’re gonna put the theory to the test and settle once and for all whether SEO and marketing are ongoing processes all of the time. The greatest marketing campaigns in the past few months have been interesting. Deadpool’s marketing campaign was the embodiment of the comic book character. The pinnacle moment of their campaign was when they used emojis in the title of the film, which then didn’t have the expected reaction, so they changed it to say what everyone else was thinking. How did it work so well? Because it looked like the anti-hero himself wrote and put together the marketing campaign himself; Deadpool is famous for breaking the fourth wall and making hilarious jokes. Deadpool’s marketing was a hit success that has brought the film to be the highest-grossing film to come out of Fox Studios. On the other hand there are those that have used marketing so well everyone is talking about them. He may be outrageous, foul-mouthed, and offensive to say the least, but Donald Trump’s actions both in public and through his marketing campaign are (sadly) gaining a lot of popularity. Winning major seats in the run to be the presidential candidate, Trump has used opinions that many are afraid to speak about and it’s working. So what can we learn from the candidate that’s hated so much in Britain they discussed banning him from entering the country? Be blunt, be controversial and be brave. Controversial and offensive are not synonymous. The most famous of marketing campaigns are the ones that stick in people’s minds for a very long time, but the money they earn from such campaigns will decrease over time despite its success. This is probably why films are now breaking up into two or more parts – bigger hype and marketing opportunities = more money. Moving away from films and presidential hopefuls, marketing and SEO are both ongoing battles to perfect, and even then it will need constant monitoring and updating as time goes on. The online world changes faster than cooking breakfast in the morning, and so do marketing and SEO. Many businesses find that regular marketing of a business reveals a lot about their product, their demographic and where they’re going wrong in their marketing efforts along with customer behaviour. Testing and finding what works for businesses is done through marketing and SEO-ing your website on a regular basis; unless you’re a big brand like CocaCola you’ll be watching your customer numbers like clockwork. As SEO is a major part of where you end up in the SERPs, the way your website looks to Google is more crucial than is lead to believe. Sites like Deep Power have it to a tee, with a visual landing page and calls to action, either in the form of booking or contacting a specialist to deal with a quote and a chance to save some money (as this site caters to Japanese skiing holidays customers would love a discount when they can). SEO-wise they target the most popular keywords such as “ski holidays Japan” and have an easy-to-use website, but even the most simple of errors can be found on the most popular of websites. 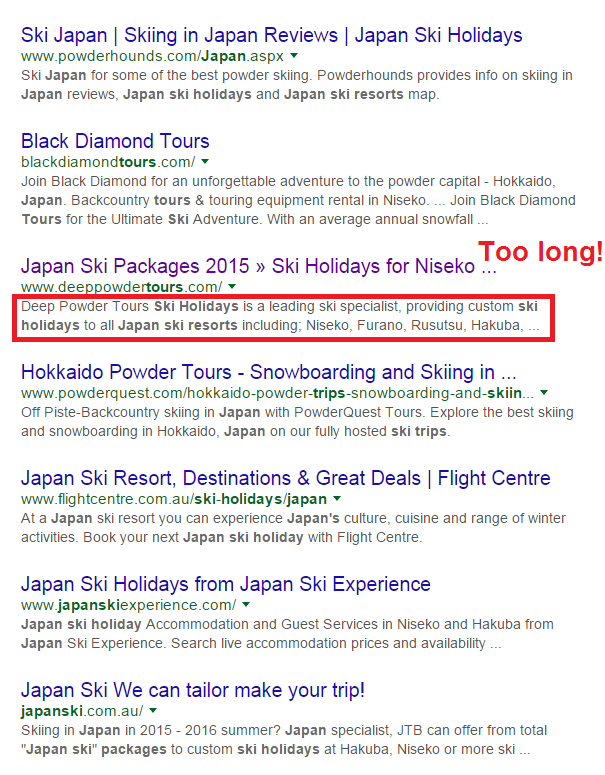 Looks like Deep Powder needs to shorten their meta descriptions for the best SEO practices. But what does this mean? No matter how big your business is online you will still need to work on SEO as different elements change, even if meta descriptions are the foundations of good website SEO. As Google changes rules, and with a slow release of the latest update, websites need to think on their toes and update their content as and when Google decides to roll out new options. The latest update was Google taking away the sidebar of adverts, meaning businesses now need to rely on inbound marketing more now than before, and also increasing competition for the top spots on search engine results. Big brands will know what’s working and what’s not, with marketing on the agenda every day, but SEO requires the same love and attention. Marketing and SEO blend together perfectly to produce some of the best working websites on the Internet, which is why it’s not a one time payment and should be looked at regularly. As SEO methods change very quickly so does the market, which is why SEO is truly more valuable than is led to believe, and marketing works within that to keep websites looking fresh. 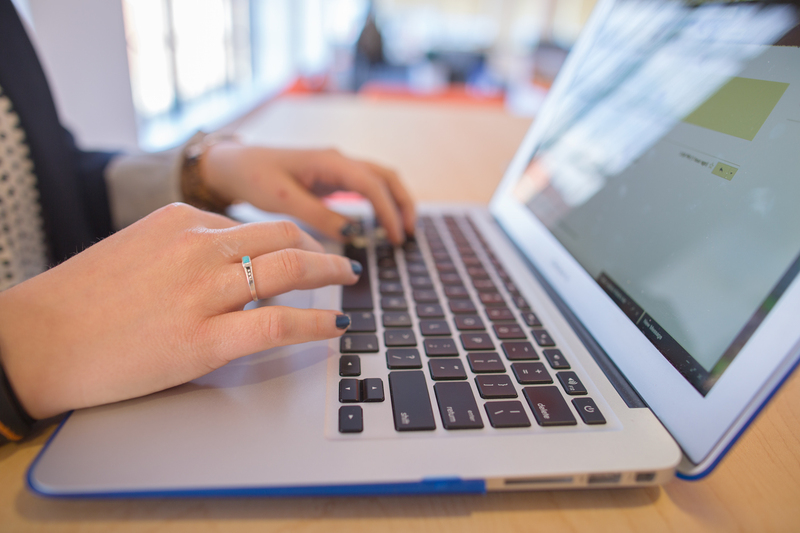 Change landing pages often, mix up your meta descriptions and optimise those alt tags, research your competition and what’s going to change next in SEO and marketing to always be one step ahead of the game. In need of an SEO doctor? Get a free checkup of your website to see where you’re losing sales!